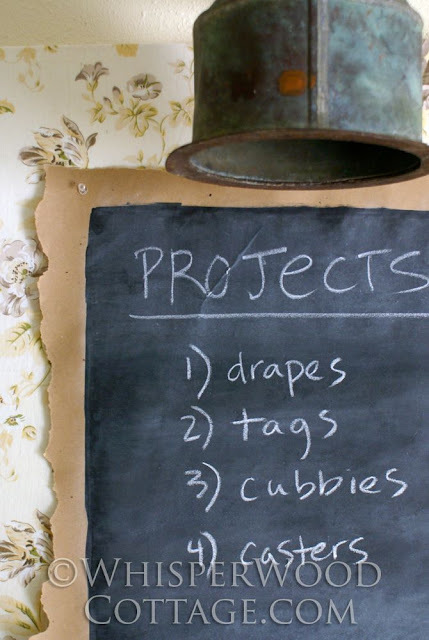 Did you see this clever chalkboard idea from Amy at WhisperWood Cottage? I just loved it and decided to whip one up myself. It was so easy. I had everything on hand so I didn't have to buy a thing. Click on her link above to see how to make your own. It's pretty simple; just tear the paper, paint, let dry, pin it up and write on it. This is one of my favorite pictures in blogland. It's from Tina at The Rubies' Place. I had a tub but it wasn't white nor old nor chippy like hers. No worries, I painted it white. I also had a couple of small ladders. So, I thought I was all set to recreate this on my porch. I don't know if my ladders were too small or my tub too big, but mine just didn't work. we found a couple of these little plant stands. It's white, chippy, rusted and just might work. I put my newly painted tub on top and it looks pretty good. I don't love it as much as Tina's but I do like it and it'll work for now. ...paint something or write something on the front of the tub. What do you think? Don't you think it needs a little something? Ooooh, thanks for the mention! The chalkboard paint on the white craft paper is awesome! I'll pass on the garden work, but I'd love to go to the antique store with you! 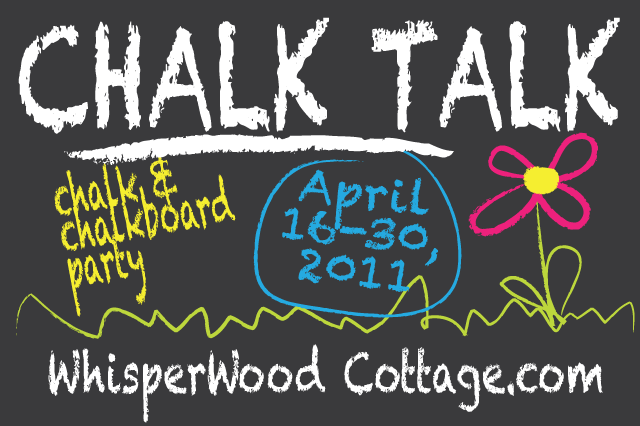 :) I hope you are planning to link up to the Chalk Talk party (April 16-30). Yep. I would put something on it. The word Bloom. A fancy cut-out. Or your address numbers if it is on your porch. Very pretty, I think your house numbers would be great on the tub. Ooh you've been busy girlfriend! I always love your projects. love the white chippy plant stands it turned out great! looove. I can't see the pics of your inspirations but your versions came out terrific. Love the tub on the stand. You could put your house numbers on it. Great stuff! I sent a lady back to your booth yesterday who is working on a teachers break room...I thought that chalk board and some of your stuff would be GREAT for her. Also, I have not forgot you large number 3 signs...I will get them to the front desk next week. Have a GREAT weekend. The chalkboard on paper was a great idea! Looks great on both the brown and white paper. Love the tub of flowers...perfect on the chippy stand.